Karina's Kreations: February Mediterranean Achievers Blog Hop! February Mediterranean Achievers Blog Hop! Welcome to the February Mediterranean Achievers Blog Hop! The theme this month is One For the Guys and we hope you get some great inspiration! 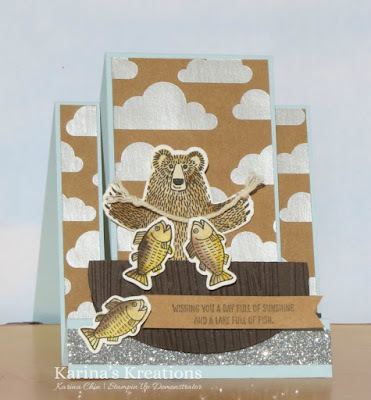 I fell in love with the Bear Hugs stamp set when I first saw it in the Occasions catalog. I especially loved the matching Bear Hugs framelits. 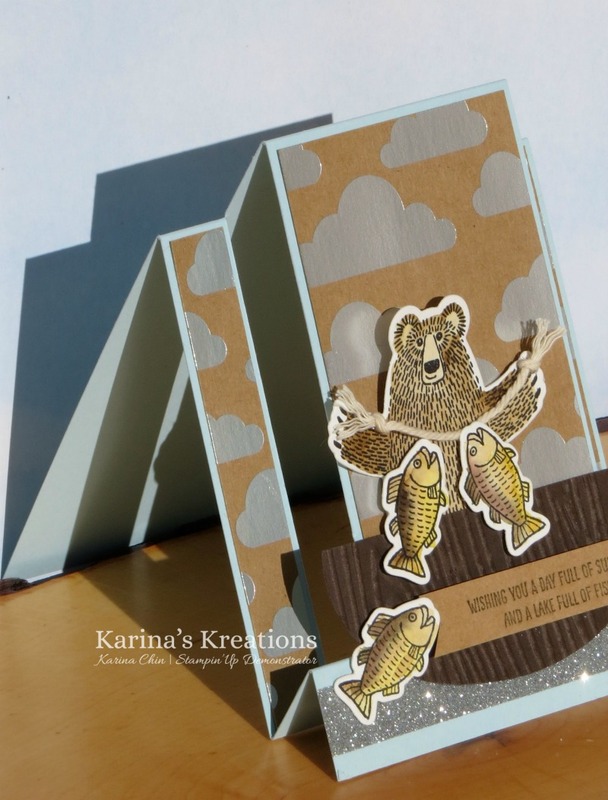 I wanted to create a cute fancy fold card that would be perfect for a guy and came up with a Stair Stepper card. 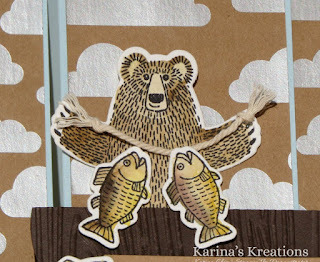 The bear was stamped on watercolor paper with Black Archival ink and colored in with an aquapainter and Soft Suede and Hello Honey ink. The background for the card is the amazing Shine On Specialty Designer Paper. The silver clouds come already embossed in the paper. It's gorgeous!! When you buy the Bear Hugs Bundle and Specialty Designer Paper you can get a Free Sale-a-bration item. I would recommend the Metallic Glitter tape. It comes in three colors and you can do so many fun things with this tape. I added some Silver Metallic Glitter tape to the bottom of my card. I created a list and a made a video of 8 things to do with Stampin'Up Metallics Glitter tape that will be posted on my blog tomorrow. Here's a quick video for the Stair Stepper card. Thanks Zoe! I can't wait to meet you too! You know I didn't get the bears but this is really cute! Your card is perfect! Thank you for the video too. My son is a bass pro fisherman and loves to hike in bear country. This will be a perfect birthday card for him. I bought the set not knowing just what I would do with it. Now to capture a bass fishing boat image and it will be perfect. Thank you. Enjoy the Mediterranean. Good Luck finding a bass fishing boat image. I was going for a canoe but ended up with more of a tub. Oh well! Thanks for all your comments!!! You made my day!